The islands of the Turks and Caicos dot the tap water clear seas of the British West Indies. Incredibly clear water, tinged turquoise against the sky, laps gently against the pristine beaches and secluded coves of the islands. Powerboats, yachts, and tour boats, packed with visitors, make frequent passage in and out of Leeward Marina on the tip of Providenciales, the tourist hub for the Turks and Caicos. Nestled between snorkel and sailing excursion providers, Big Blue Unlimited challenges visitors to the Turks and Caicos to "keep it simple" and explore the islands without impacting the environment - a tough call on an island that subsists on tourism. Providenciales cannot be described as eco-friendly. Surrounded by cranes, concrete and construction, it's easy to miss the hidden cays, mangroves, and local fauna and wildlife that is abundant on the islands. Big Blue Unlimited is trying to change that. Offering eco adventures is their business. And they do an excellent job educating, entertaining and enlightening their visitors. 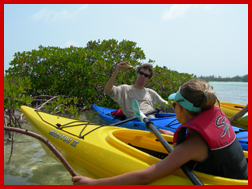 Big Blue's kayaking adventure seemed the perfect fit for our sports oriented, adventure loving family. After a brief orientation and paddling lesson, we headed out in our two person yellow kayaks, paddles at the ready. A brisk breeze was a challenge, but after a few minutes we got into the groove of synchronized paddling and headed to our first stop - a secluded beach at the tip of the island. Donny, our guide, sent us scavenging for shells and other natural beach debris. Big Blue takes the "eco" part of the adventure seriously. Donny quizzed us on marine life, gave us a brief, but quite educational history lesson on the islands and its people. My ten-year old said, "It's a lot like school". I just wish we had done this adventure at the beginning of our trip instead of at the end. Knowledge is power. From our brief pit stop at the beach we headed across the channel to Little Water Cay, also called Iguana Island. 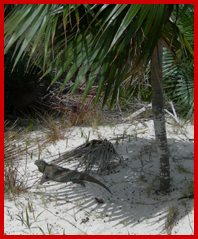 It's a protected sanctuary just for the Rock Iguanas. Again, Donny regaled us with information on the iguana's habitat and history. Much more interesting than the previous tour we had in which I deciphered that you should wear red nail polish unless you want your toes bitten off - or something like that. After a refreshing dip, we were bound for the mangrove channels to seek out some marine life - maybe even a shark. The wind had come up, and it was a bit of a battle to cross the channel. Feeling the burn, we paddled and paddled. With a quick left we entered the mangrove channels. Protected from the wind, it was a mellow paddle through incredibly clear water. Donny pulled up a conch and gave us some background on the creatures' habitat and importance to the sustenance of the island. No sharks on this trip, but we left with a feeling of accomplishment. Not only had we faced the wind in our yellow crafts, but we had learned quite a bit about the island, its people, its history, and accompanying marine life. It was an eco adventure indeed. 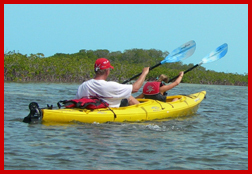 Big Blue Unlimited offers many different adventures. From scuba diving to mountain biking, there's an adventure for every family. With a focus on small groups and minimal impact on the environment, Big Blue walks the walk, and it shows. For more information on Big Blue Unlimited, see their website at BigBlue.tc . For family friendly lodging see Ocean-Club.com . Centrally located, this upscale condo resort on Grace Bay Beach is the perfect place to sooth those sore paddling muscles. More on family destinations here.